In search of money and freedom from the American justice system, criminals from the United States moved to Eastern Europe, where the laws were replaced by the crime after the collapse of the Communist system. Many of them chose Prague as their hideout, where crime lords were willing to pay a suitable sum of money to assassins in order to eliminate their rivals. One such assassin, Ray Carver, works for two rival gangs as their main killer. When Ray attempts to murder a Chechen drug lord, he is being pursued by the mobsters. Meanwhile, Suverov mafia hires Alexey ‘The Wolf’ Andreev, an assassin from Russia who is rumored to be not existent. This is when the real gang war starts. 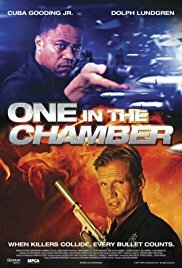 Hopefully they didn’t pay the screenwriter of “One in the chamber” too much, because he wrote this story with his hands tied behind his back in a long night session. What a simplistic insignificant story. And there you have it. I could have made that up easily in one night. Mix that with an idyllic story of a handsome chick who lives in Prague, who was the daughter of someone who was eliminated by Cuba and the picture is complete. Nevertheless it started really well. The opening credits looked almost like “Se7en“. The scene in which Cuba uses a huge sniper rifle and the way it’s filmed, is fantastic. And then it slumps down and transforms into a common “Terence Hill & Bud Spencer” story, but with guns and machine guns instead of fists.